Our only day out on our snowmobiles this season was a beautiful one! Hello everyone! I feel like I’ve been away a long time. I certainly haven’t blogged in the last few months as I intended mostly because this winter has not turned out as expected. I really thought I would be posting weekly MN snowmobiling reports but that’s what I get for thinking! Our snowfall has been skimpy and, as a result, snow conditions around us have been poor. 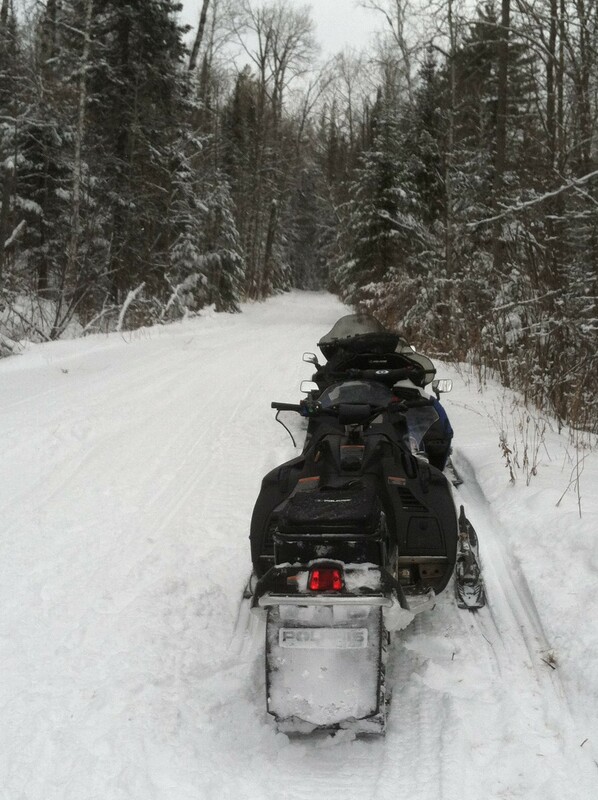 In fact the Bushwacker Snowmobile Trail that runs just south of the resort was never groomed this year. Not enough snow! (Boo Hiss!!) However, we did manage to get in one good ride. At the end of January we trailered up to our friends house on North Star Lake and snowmobiled from there. They had about 8 more inches of snow than we did! It was a long day – we rode as long as we possibly could – and we saw trail conditions from good to terrible. But still – we can say we rode and that means a lot during a winter like this one. What a beautiful fish! 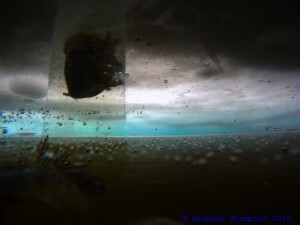 Photo courtesy of some of our wonderful ice fishing guests. While snowmobiling options have been limited this year the ice fishing opportunities abound! Low snow means that the lake is very accessible by vehicle so we’ve seen everything from mini-vans to Gators out there! (For some reason mini-vans out on the ice crack me up.) Early accounts reported the sunfish in the shallows since the lack of snow means the vegetation didn’t die off as it normally does. However, fishermen in this weekend caught their sunnies in 18 feet of water. 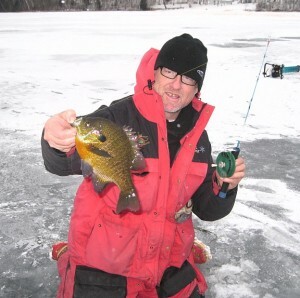 Overall fishing has been good and our ice fishermen this season have generally caught their limits. Jay has dumped a steady amount of fish guts every weekend that we’ve had guests. It keeps him out of trouble! We are really looking forward to the summer season already! This time of year it’s really fun to answer the phone and talk about Minnesota family vacations. Makes me think of summer days on our sandy beach even though I’m looking out the window on a winter scene. I’m ready for s’mores by the fire, potlucks on Monday nights, fun works-of-art created during our kids’ activities and checking in and catching up with our guests. Our summer has booked up nicely but there are still some prime summer weeks open. If you haven’t planned your summer vacation at this point we would love for you to consider a visit to Wildwood! What a cool photo of a bluegill in the “tube.” Again – photo courtesy of guests.